These parts make it possible to mount up to 5 2 1/16" or 2 1/8" custom gauges and either a 3 3/8" or 3 1/8" Speedometer in 3 styles of speedometer plates. They are completely bolt -on and require no modification to the stock cluster housing in all configurations, except Style #3 speedometer plate as noted. They may be installed to any cluster, you may even install them on a previously painted cluster without damage. Many options are possible so you can personalize to suit. All parts are cnc milled billet aluminum tube or plate. We have 0-30 ohm Fuel gauges that will work with stock gas tank sending units and several 2 1/16" Tachs. Column shift automatic cars need to use column mounted shift pointer and indicator that we now have in stock. Note! Prices do not include gauges. Call for Gauge Sets or use gauges as noted. 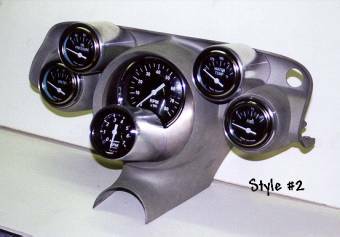 57 GAUGE PODS Pair of cnc milled aluminum tubes that allow the addition of 2 aftermarket 2 1/16" or 2 1/8"gauges in place of OIL and GEN idiot lights, requires use of stock gauge cluster trim, no mods to gauge cluster housing. W/ hardware and instructions. 57 GAUGE RINGS Pr of cnc milled aluminum rings that allow the addition of 2 aftermarket 2 1/16" or 2 1/8" gauges in place of stock TEMP and GAS gauges, no mods to gauge cluster housing. 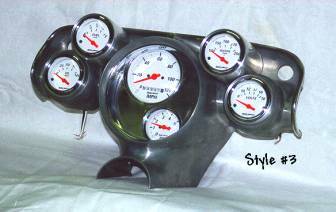 Mounts with aftermarket gauge hardware. Includes instructions. 57 SPEEDOMETER PLATE STYLE #1. Made to mount 3 3/8" speedometer from front. Has 2 small holes for 2 idiot lights [High Beam & Generator] Lights included. 3 Ball Mill grooves. Includes mounting hardware & instructions. 57 SPEEDOMETER PLATE STYLE #3. 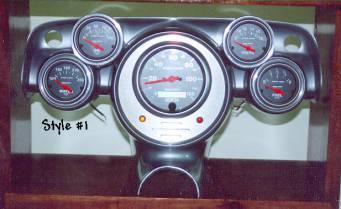 Mounts Autometer 3 1/8" speedometer and 2 1/16" tach or other gauge in single plate recessed into and installed into front. Uses stock speedo trim ring. May be installed in a variety of positions but to mount gauges straight up and down 2 screw bosses on back inside of cluster housing must be ground down about 3/16". Has 1 small hole for idiot light [High Beam] light included. Includes mounting hardware & instructions.